Experience some of China’s greatest wonders with Yampu’s “Terracotta Warriors and Karst Hills of China” tour! After walking through the historic Chinese capital of Beijing, jump a bullet train to another one of China’s top destinations. In the city of Xi’an is one of China’s most historic and mysterious points of interest, the Terracotta Warriors. Created to assist China’s first emperor into the afterlife, thousands of clay soldiers guard the tomb of Qin Shi Huang Di, each with their own distinct and individual characteristics. After pondering these enigmatic figures, head on over to Guilin for some of the most beautiful views in the world. Rising from the flat ground are sudden and extraordinary limestone formations that have developed over millions of years due to weathering and geological shifts. Take in these stunning views while on a delightful cruise along the crystal clear Li River. With the help of Yampu, one can experience these fantastic ambiguities in person, hassle free! After arrival at the Beijing international airport, be met by the local guide to assist with the transfer to the city. Transfer by to the awaiting hotel in the heart of the city with an opportunity to rest and prepare for the remainder of the day Note: Check-in is normally after 2 pm. Early check-in may be granted subject to availability (not confirmed). If you would like guaranteed access to the room (at an additional cost), please advise a Yampu Travel Consultant. After breakfast at the hotel, visit the Summer Palace. The former site of retreat for the imperial family, the Summer Palace provides a range of striking views and the opportunity to take to Kunming Lake. Its buildings and courtyards are beautifully decorated and charged with history. Lunch at a local Chinese restaurant. Transfer to the train station; take Bullet train to the ancient capital of Xian. Transfer to hotel after arrival. After breakfast at the hotel, transfer to the pier to board the awaiting vessel for a leisurely scenic cruise of the Li River to Yangshuo. A simple lunch will be served aboard the boat. Upon arrival in Yangshuo enjoy some free time to explore this exquisitely gorgeous setting and marvel at the heavenly natural surroundings. Set against a backdrop of breathtaking mountains, the area has an abundance of attractions to discover. Dinner will be on one's own. After breakfast at the hotel, transfer by bus to Guilin airport for connection to the international departure flight. Located near Central China, Xi’an is another historical city of great importance to the development of this culturally rich country. Once the eastern terminal of the Silk Road and home to the famous Terracotta Warriors of the Qin Dynasty, the city of Xi’an has been a part of more than 3,000 years of history. Over 1,100 years Xi’an was the capital city of ancient dynasties, gracing the city with an amazing historical heritage. Guilin is considered one of the Pearls of China due to its spectacular treasures and landscape. Shrouded by sheer sided karst mountains and surrounded by numerous rivers and lakes, Guilin is a place of wonder. Explore Reed Flute Cave with its beautifully lit rock formations and fun romantic stories behind them. Visit outside of the city, Dragon’s Backbone Rice Terraces, where thousands of acres of rice patties covering the base of Longji Mountain. A 15-minute walk from a metro station providing service to downtown Beijing, this sleek, modern hotel is 8 km from the Forbidden City. Polished rooms feature free Wi-Fi, TVs, minifridges and desks. Upgraded rooms have rainfall showers, along with access to an executive lounge offering free breakfast, snacks and drinks. Suites add living rooms and dining areas. Room service is available. Amenities include a bright, modern restaurant, a cozy lobby bar, and a spa area with a sauna and massage treatments. There’s also a fitness center and an indoor pool, as well as a grand ballroom. Featuring city views, the subdued rooms come with free Wi-Fi, flat-screen TVs and minifridges. Suites add sitting rooms and/or dining areas. breakfast buffet is served in the international cafe (fees may apply), and a 2nd restaurant serves Cantonese and Shaanxi cuisine. There’s an indoor pool, a gym and a game room with table tennis, plus a business center and 5 event rooms that can hold from 70 to 700 guests. Tranquilly set amongst the mountains and Peach blooming River, 20-minutes-drive from the international airport, the Grand Bravo Guilin greets you with the most breathtaking scenery in Guilin. 2 km away the center city, our five-star resort enjoys private access into the unspoiled beauty of nature. Strolling through our spacious botanic garden, surrounded by varies of ancient plants and precious flowers; here you’ll set foot in the precise balance of human and environment. Overlooking the Western Hills through your window, enjoying the spectaculars European style of furnishing and hand-made decoration in any one of our 735 deluxe rooms, up-dating yourself via the complete coverage of hi-speed internet, the state of the art facilitation provides you an unforgettable stay with us. The different types of Chinese, Western and Japanese restaurants fulfill exquisite tastes and flavors up to your appetite. The grand marbled archway leads through into our extensive outdoor courtyard, an ideal place for private parties or elegant weddings. The grand 1000m Ã‚Â²column-free ball room is designed for formal conferences or banquets, and several stylish multi-functional halls are preferred venues for all kinds of events . As the dawn comes, spend a relaxing evening diving into our indoor heated temperature swimming pool or get sweaty in our modern well-equipped fitness-center, after that, don’t miss reenergizing yourself in the supreme spa center and two refined bars, clubs and will sure be nightlife enrichments. Located at the foot of the Green Lotus Peak in Yangshuo, where bears the famous saying, Guilin’s Landscape tops those elsewhere, while Yangshuos landscape tops that of Guilin, and on the bank of the Li River, Yangshuo Green Lotus Hotel is a top luxury hotel integrating the natural beauty of mountains and rivers and the local minority peoples architectural feature, which is also designed and established according to the standards of the national five-star hotel. The hotel was named from the poem Master Tao Yuanming, Magistrate of Pengze County, cnce lived beside five willows, Magistrate Pan Yue of Heyang only beautified his town with some flowers. Comparing with the two, Yangshuo is far superior; because families here make their abode in the Green Lotus Peak. composed at the foot of the Green Lotus Peak in Yangshuo by Shen Bin, a modern poet. Yangshuo Green Lotus Hotel, enjoying the convenient traffic, is adjacent to the ancient Li River Fu’an Wharf; therefore, you can walk on the bank of Li River without leaving the hotel. In addition, it is only about one-hundred-step distance from the renowned Yangshuo West Street. In the hotel, you can take a distant view of the performance place of Impression of Sanjie Liu. The hotel near mountains and rivers, enjoys the graceful and elegant environment. Located a heartbeat from the legendary Forbidden City, Regent Beijing invites travelers to immerse in more than 3,000 years of history from the sanctuary of one of the world’s finest hotels. Ideally situated to explore the capital’s most iconic historical and cultural landmarks, and its modern urban attractions, Regent Beijing’s rooms and suites combine classic style with elements of oriental elegance and 21st century amenities for unequivocal comfort. The heritage of Xian and the classic French hospitality of Sofitel combine to create a stunning 5-star hotel welcoming business and leisure travelers to the heart of the city. Sofitel Xian on Renming Square is located centrally within the Xian city walls near many historical sites including the Bell Tower, Drum Tower, Great Mosque, and Forest of Steles. The airport and Terracotta Warriors are both a 45-minute drive. Rest in the shadow of Lishan Mountain’s exotic greenery at our luxury Xi’an hotel. Be awed by life-sized sculptures of warriors from the First Emperor of China. Marvel at 6,000 year-old relics at Banpo Neolithic Village Museum and climb Xi’an’s Big Wild Goose Pagoda. Come to Xi’an to watch living history, and learn more about the largest ancient military defense system on the globe. Sway alongside traditional dancers as you watch the Tang Dynasty Show’s swirl of exquisite costume and spirited dance moving in tandem to the beat of traditional music. Live life at our hot spring resort, set against the backdrop of breathtaking natural scenes, glorious weather and cultural legends. The distinct Chinese-style architecture is a fascinating sight to behold. The indulgent Asian hospitality is heart-warming. You have arrived at Shangri-La Hotel, Guilin. There is no hurry. Your spacious room is just the haven you need to slip into a blissful mood. After all, it is easy when a magnificent view of the crystal-clear Li River and gorgeous landscaped gardens is right outside your window. Guilin literally means “forest of Sweet Osmanthus”. The streets are lined with these fragrant trees. As you traverse the city, you are constantly aware of the breathtaking hills with their surreal rock formations.Between saccharine scents, sounds of the river and majestic hills, you are absolutely spellbound. 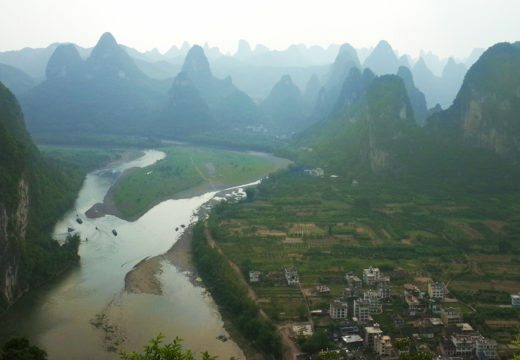 Guilin’s claim to having the “finest mountains and rivers under heaven” is indisputable.